A pan Igbo group under the aegis of SE Renewal Group, SERG today blamed IPOB leader Kanu for the escalating crisis in the South East. SERG President Charles Mbani in a press briefing in Abuja today called on Igbo leaders to do the needful to prevent the impending war. He added that IPOB youths have been brainwashed to believe the Nigerian army as the enemy. “You must have, like other Nigerians, watched recent events in Igboland with a sense of foreboding, concern and utmost dread. Images emerging from the southeast, our homeland, are as troubling as they are worrisome with the most recent being those of youths attacking military detachment with all manners of crude weapons including catapults, cudgels, machetes, sticks and others. “These youths are being put up to this mischief after being brainwashed by the so called Indigenous People of Biafra, IPOB, which is now militarizing them as its fighting force. 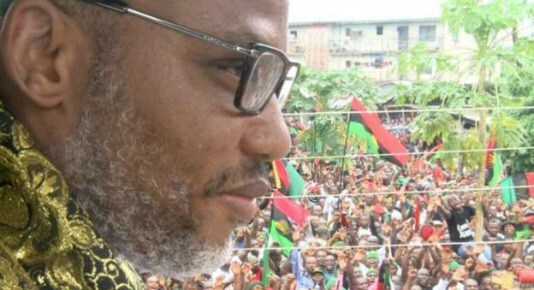 “These misguided youths have been deceived into thinking they are making the right sacrifice of protecting Nnamdi Kanu, the IPOB leader whereas the only thing they sacrificing is their lives that they are throwing away on the altar of ignorance. “The soldiers attacked by these uncouth elements are the ones taking part in Egwu Eke II (Operation Python Dance II), which we find most ridiculous considering that the same operation last year ensured that kidnappers and armed robbers that were desecrating our land were curtailed to a point where Igbos enjoyed peaceful 2016 Yuletide. “We are therefore wondering if there is a nexus between IPOB and the crimes being eradicated by the military for its youths to become virulent on the scale being witnessed. “We urge other well-meaning elders of our land to join in condemning the incidents. The unnecessary attempt to provoke the military into using stick to address the Biafra issue would be catastrophic and those who love the region should do so well to warn their children from setting the region ablaze. “The hate speech has now crystalized and is the bedrock of the aggression being exhibited against the military. It nothing urgent is done the next phase in this ugly evolution could threaten our existence as a people. the **** kehinde and e **** will now come and yan opata.the northerners is crossing the red line. I love Kaun is not an hypocrite person.